It's always exciting announcing a new label especially when it stretches new genre boundaries and Discover Code Red plans to do exactly that. With an emphasis firmly on deep and dark techno / electronica grooves DCR certainly starts as it means to go on. This two track single from May - I starts with the stark groove based Karma which builds with melancholic darkness throughout. Plata O Plomo continues the theme with a hint of classic old school vibe set against the subtle stab based melodies. 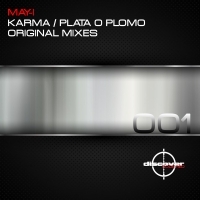 'Karma / Plata O Plomo' is available now from Beatport and iTunes.